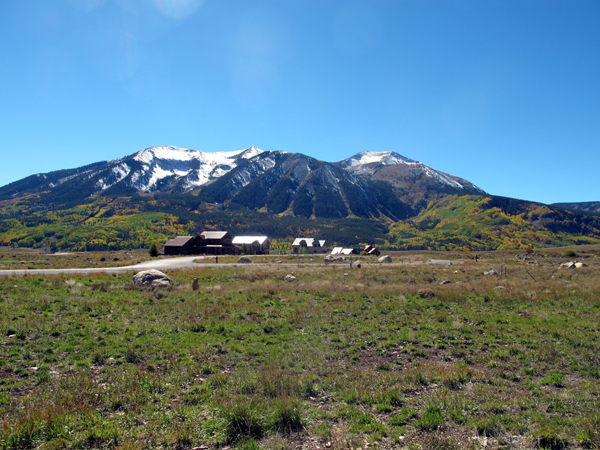 The Buckhorn Ranch subdivision near Crested Butte is located in the beautiful Brush Creek drainage a few miles away from the town of Crested Butte. Other neighborhoods in this area include Larkspur and Skyland. Wide-open vistas are the rule here, with Whetstone Mountain dominating the skyline along with the backside of Crested Butte and Paradise Divide. One of he key feature of this neighborhood is the airplane landing strip which allows true fly-in/ fly-out access to properties surrounding the airstrip, known as the Avion Club. This is an amazing opportunity for plane owners to fly in and be fishing or skiing within minutes! The Brush creek drainage is a recreational hotspot in Crested Butte as well, with miles of hiking/biking trails right outside your door, including trails like Strand Hill, Whetstone Vista, and the Upper Upper loop. In winter, Brush Creek is a great place to cross country ski, and snowmobiling is available as well. This neighborhood also features low homeowner association dues and low property taxes on undeveloped land (as of 5/2018), though these are subject to go up as the community expands. Roughly $500,000 was spent in the spring/summer of 2015 sprucing up the neighborhood, with a new entrance, new signs, and additional landscaping. For more information regarding Buckhorn Ranch, or if you are interested in selling your Buckhorn Ranch property, contact me anytime. Buckhorn Ranch Crested Butte real estate information including maps, descriptions, prices, and current properties for sale. Get detailed info on Crested Butte neighborhoods.